I’ve been doing a bit of swatching this week, toying with some design ideas and playing around with colours and options. Which is also a sort of professional-looking way of saying “I’m sitting in an indecisive mess of yarn,” but then, as Annie tells me, a creative mess is better than tidy idleness, so I’ll take it. What you do here is cast on enough stitches to get you a decent amount of fabric – say, 5-6 inches worth – onto a circular needle, and as you work through the swatch, when you get to the end of a row you just slide the whole works back to the front of the needle sort of like the carriage-return on a type-writer. (A circular needle is both flexible in the middle and pointy at both ends, which is why this works. 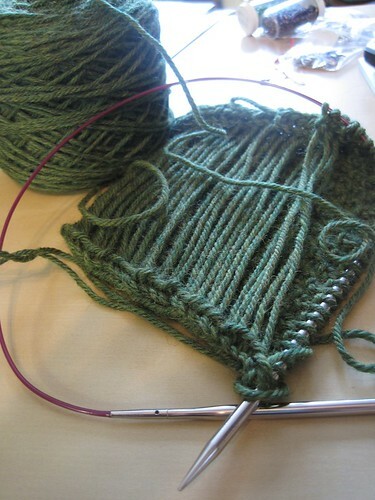 Circular needles: not just for circular knitting any more!) The effect is that you are only ever knitting the Right Side of the work, so you will get a gauge reading similar to what you will actually have when knitting in the round, since knitting in the round will also only require you to work the Right Side. The other effect is that the wrong side of your swatch will look like a big ol’ mess, since every time you start back at the beginning of the row, you leave a trail of yarn behind. Once you’ve done the amount of swatching you feel comfortable with, you cast off as per usual, and then get out the scissors and snip those yarny strings at the back, and then you have a flat swatch. 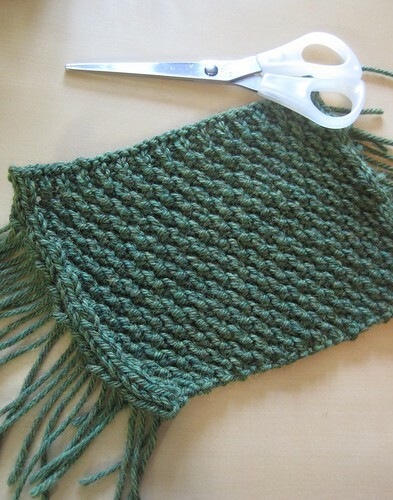 Provided your swatch is not 100% non-wool, the strands will not unravel at the sides very quickly and you’ll be fine. This also works well for just plain stockinette if all you want to do is avoid the process of going in the round – say, for a sock. DPNs would work well enough in place of a circular needle, if they’re long enough to handle what you want to cast on. When you’re done, there is naturally still the question of what to do with the swatch once you’ve finished it and gotten your gauge reading and had your way with it and don’t need it any more. But everyone likes knitted coasters, right? I thought so. And for those who are still working up the nerve to steek their first piece of knitting, they serve the extra purpose of practice piece. Ideal to check which reinforcement your steek needs, and cutting this “coaster” is far less daunting. But yeah, I need some coasters. No really, I do! That’s the way I swatch in the round, too! My gauge is invariably tighter knitting in the round, so I get the most accurate results this way. Instead of doing hats, I do headbands/earwarmers, which I always wear skiiing every winter and inevitable lose in the pursuit of the that activity every winter. That’s my ‘Basic Black’ cardigan pattern! Originally published in MagKnits, now available for free on Ravelry or on my Free Patterns page. This method was first revealed to me by Ysolda Teague, but I have to say I’m not a big fan yet for two reasons. 1. I tend to save my swatches in case I run out of yarn – then I can unravel it and sometimes get that extra few yards I was missing. So the cutting that is required here seems like a waste of good yarn to me. 2. I found that I had to cast on quite a few more stitches, because the first few stitches on the edges (i.e. those directly next to the loose strand from the back) would be much looser than my regular gauge, so I would have to cast on say 5 extra stitches on each side and then just measure the gauge on the middle stitches. You are right that this method doesn’t allow you to pull out the swatch and reclaim the yarn – in that case the in-the-round swatch would be the one for you! I have not usually been bothered by it, since I like having the finished swatch as a reference, particularly in the case of colour-work, even after I’ve taken the gauge measurement. It does leave a few looser stitches at the side, but as long as you’ve got at least 4 inches’ worth of regular fabric in the middle, a normal gauge reading is still possible! I love this swatching method. Very timely blog post, I actually just did a swatch like this the other day and was thinking about how if I were clever, I would have taken some photo documentation of the process and blogged about it. Now I’ll just link to this post when I talk about the short cut for swatching in the round. Thanks Glenna! I’ve never seen this technique – thanks for sharing it! It’s faster for me! And it works for me for gauge as long as there is enough fabric. I must not have the same loose stitches problem that it sounds like others do. And, I like this sachets plan. I like the description, sitting in an indecisive mess of yarn. Been there many times. 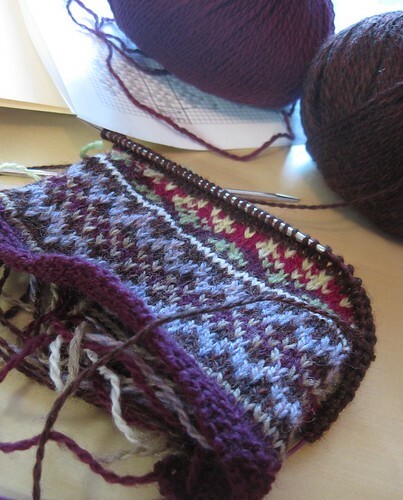 Great post about swatching for circular knitting. I swatch in the round like this. But since I like to unravel and use my swatches I leave the loops on the back long enough to flatten the swatch w/o cutting it. Might not work for everyone. 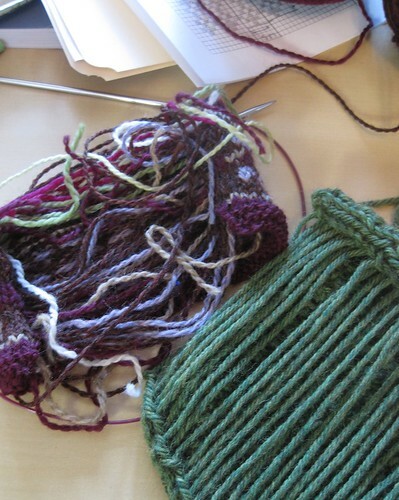 Of course you have to knit a nice big swatch to avoid edge distortion. I have always knitted my ‘flat’ swatches 8 x8 inches and saved them. Eventually I stich them together for a blanket. I am going to try your method for circular. This post was very helpful to me, I did not know about this method before. Thank you for sharing it with us! Hi – what is the stitch in the solid teal-ish yarn in the last photo?